If you build, maintain or tune web sites you’ll know about the browser cache and how to control caching using HTTP response headers. We’ve talked about caching in several previous posts. However, you may not be aware that IE uses two caches for holding images. First, there is the regular browser cache that keeps a copy of downloaded image files in your Temporary Internet Files folder. It’s this cache that can be controlled by HTTP response headers such as Cache-Control and Expires. The point of the image cache is that it can be used to quickly render images without taking the CPU hit required to convert them from their native compressed format into a Windows bitmap. 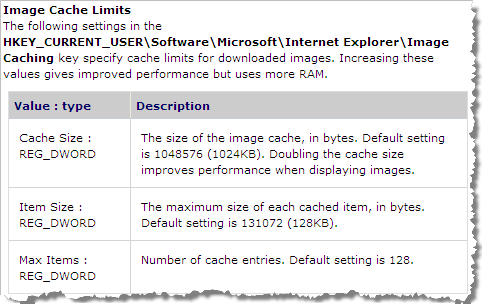 Although, these settings don’t work with IE 6 or 7 they do show that the image cache has limits on the size of images, the number of images cached and the maximum amount of memory that can be used. Limits like this have to be set because the expanded images can take up to 500% more memory than the original PNG, GIF or JPG format. 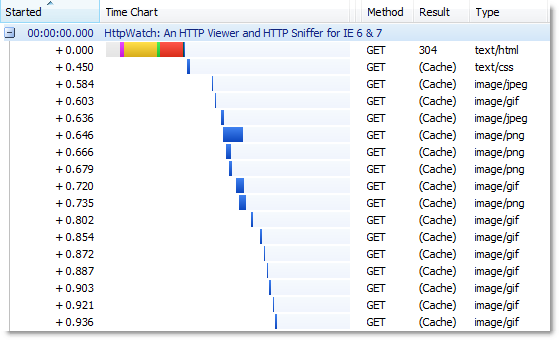 The (Cache) responses shown in HttpWatch indicate that the images on our home page were read from the browser cache. The image cache would have been empty at this point because IE had just started. Clearly, all the images for the home page must have been loaded from somewhere because the page was correctly rendered, but only two images requests from the browser cache are seen in HttpWatch. This is because the other images were read from the image cache. Why were two of the PNG files still read from the browser cache? These two images are the largest image files on the page and they would expand to approximately 500 KB and 300 KB if they were both placed in the image cache. They probably breached the maximum image size limit in the IE 7 image cache and were therefore not stored in their expanded form. It’s also possible to see that the image cache has a limit on the number of images it stores. Try visiting ebay.com and then yahoo.com in the same browser window to load up the image cache. If you then go back to www.httpwatch.com you’ll see that all the images have been flushed out of the image cache and had to be reloaded from the browser cache. Of course, you should always try to minimize the number of images to reduce the network round-trips when a browser first loads a page. A popular technique for doing this is to use CSS sprites to merge several images together and there are some great tools to help you create the compound image. Be careful though, that you don’t run into item 2) by creating a single large image that is not loaded into the image cache. You would get the benefit of less round trips on an initial visit, but the rendering in IE might actually be slower because the image would have to expanded from the browser cache whenever it was re-displayed. I am using HTTPwatch very extensively and lately , have seen issue related to time lag between two consecutive requests. Even in the image shown up there is time lag beween seconda and the third request.I am seeing delay of 2 secs in one of the sample gathered using HTTPWatch3.0 in IE 7 browser with Win2k3 client machine. Please let me know the probable reasons for the time delay. The helpful one httpwatch. Thanks for the article.